I’m ashamed to say that I only (bar a couple of short stories) read anything by Ian McDonald in July this year (more embarrassingly I bought Brasyl when it first came out and have only just gotten around to it). I had heard many great things about him – he seems to be a bit of a writer’s writer. At least many of the authors that I like, and whose opinion on these matters I’d respect, like him a lot. Fortunately, I wasn’t disappointed, both River of Gods and Brasyl are exemplary pieces of SF. Even better, McDonald has managed to maintain the high standards set by these two novels in The Dervish House. Set in a near future Istanbul, The Dervish House traces five days in the lives of a group of people as they all try and, in one way or another, make it. It’s a dense novel full of social, political, technological, scientific and deliciously sfnal themes. This creates a heady mixture which goes some of the way to evoke the life of the city. Though, here’s where I have to take things on trust – having never been to Istanbul I don’t really know what it’s like (though my understanding is that McDonald does describe the life in the city well). The sheer volume of ideas thrown about could almost be material enough for several novels, and in less skilled hands, you would probably be wishing that the author had indeed left a few things out. Not so here. Istanbul, a huge, dense metropolitan area, straddling Europe and Asia, historically a cross-roads which has always had a huge role in history and continues to do so in the novel, is capital to a country in the process of a flowering in art, business, technology and political influence. McDonald makes the most of this setting; combining the upstarts trying to make good, with an older, wiser heads steeped in and aware of the vast history which, littered with victories and failures. Plotwise, the novel literally starts with a bang. An apparent suicide bombing on a rush-hour tram (which, oddly, seems to kill no-one but the bomber) introduces a strand with a young man, who had previously wanted for empathy, start to see mystical beings, his young neighbour sees his anguish and troubles and becomes involved in his apparent mental disintegration. A young businessman works towards the deal (or scam) which will set him up for life, while his antique-dealing wife is handed the impossible to believe and impossible to resist commission, to track down a legendary item. There’s an old Greek economist, who finds an opportunity to both atone for his own, old, transgression and also to right a wrong that was done to him by petty and jealous colleagues. Finally, we follow a young woman become involved in the attempt by members of her family to develop a technology that will change humanity. All these initially disparate strands are skillfully and subtly woven together over the course of the five days depicted in the novel for a satisfying climax. I had to go back and read that whole section again (I could really have picked any part of the novel to quote). It’s not writing that you could ever accuse of being sparse, but at no point does one ever feel that a word has been wasted. The prose describing the Mellified Man oozes from the pages.You feel the heat and the life of the metropolis. The joy at the closing of deals, the defeat where they fail and the anger at short-sightedness are all expertly rendered, at no time did a sentence or a word feel misplaced (and with the standard so high, anything clumsy would’ve been carved in relief on the page). Whilst there is pleasure in gawping at the artistry of the text, The Dervish House has plenty in it. This isn’t a prettily written book with nothing of any consequence to say. McDonald manages to unobtrusively enter gender and generational relationships. It has old-fashioned mysticism (nicely bought up to date) and the relationship that Turkey, officially secular, has with its religion. McDonald also describes, and well, the uneasy relationship that Turkey still has with itself, its own past and the rest of the world, straddling as it does east and west. Though set in the future, all of these things are concerns that currently excite debate here and within Turkey as the question of where it stands in the world and what its future holds is asked in the parliaments and press. 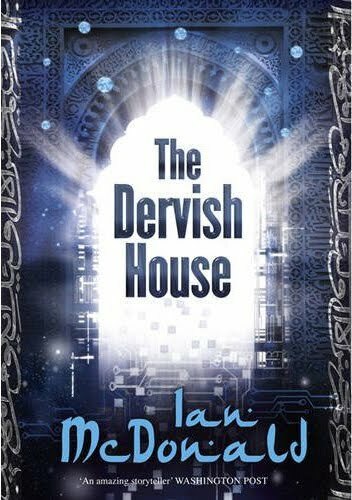 The other thing that stands out about The Dervish House is the setting (of course McDonald has used other settings previously too). Naturally, a great deal of SF is set in foreign lands – you can’t really get more foreign than an alien planet! But given the dominance of SF by English-speaking authors (especially US authors) it is rather refreshing to see a British author attempt to write about human beings who don’t live just as they do. McDonald is successful in doing this because, while he captures the differences, he also keeps the characters human. There’s no tokenism about it. The Turks aren’t there to add spice to the prose, or more unforgivably, as the servants, the background characters or the villains. They are all there displaying human traits both good and bad (I’m perhaps being a little unfair here, I’ve actually read a fair whack of SF lately which has come a long way from its WASPish, pulpy roots, but there’s also probably an element of selection bias in that on my part). The only complaint I have about this is a personal one, and that’s purely that I’ve (inadvertently) denied myself the pleasure of McDonald’s writing for so long. Truly awe-inspiring stuff. If you have any interest in well-written, thoughtful, exciting SF that is alive, this book should be high on your to-read list. This entry was posted in Review and tagged england, Ian McDonald, novel, sf. Bookmark the permalink. Thanks for cointnburitg. It’s helped me understand the issues.